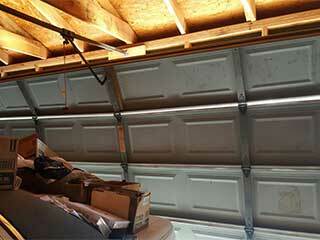 When people think about hazards in their home, they rarely consider their garage doors. These systems can become huge safety concerns if not looked at. Sometimes there are hidden problems that you simply don't know about, for example, there could be a problem with the automation mechanism of your garage door causing it to unexpectedly fail when you least expect it. Older garage door models can become outdated and unfortunately tend to wear down faster than newer models. There may be problems with the door's torsion springs, opener, and more. A good rule of thumb is to get your garage doors checked every 2-3 years for problems relating to repair or maintenance. Garage door accidents make up a significant proportion of home-related accidents: You don't want to risk having children or elderly individuals anywhere near the path of a faulty garage door! You may not know this, but rodents can cause significant damage to your garage door by leaving small holes in it and creating new openings. If it's possible for rodents to enter your house through your garage, there is also a health risk to you and your family. If you suspect rodents or other animals are entering your garage, this is a problem that you should deal with immediately – contact us to discuss your options. When buying a new garage door, we recommend you opt for a more modern technological model if you can. Low-tech models tend to wear down more quickly, with the potential for costly repair work down the line. If you know you're working with outdated technology, it might be worth considering an upgrade now as an investment for the future. With multiple innovations such as automatic door mechanisms and security features, newer models get round a lot of the problems associated with older models. Contact us at Garage Door Repair Glendale today and make an appointment with one of our experts if you think it's about time your door got looked at by a professional!